The world of succulents expanded with hybridisation and Pachyveria are a classic example. These sought after plants are hybrids of Echeveria and Pachyphytum, and we see an increasing number of them. They look great in containers, hanging baskets and if you have the right climate, in a rock garden or used in a succulent wall. These attractive succulents have thick fleshy leaves, usually a blue to blue green in colour, often flushed with pink to red and most will reach only around 15 cm in height. Pachyveria will flower in spring to summer, mostly orange to red flowers on short stems. As long as they are not exposed to temperature extremes or wet soggy soils, these are an easy care plant. They do not tolerate frosts, they will grow well in full sun, however they are better protected from full sun in extended high temperatures. We tend to plant them a position where they are in part shade, or afternoon shade at the height of summer. Watering is the second important element of basic care. These are a plant that are in active growth in winter, so they do like water during this period, however not much and generally we do not water the foliage as it tends to mark. A quick look at the foliage will tell you if they need water, if the fleshy leaves look not as plump and full as they should, or a little shrivelled or wilted, you are under watering. Growing medium need to be free draining, so use a specialist cactus and succulent mix, or add some extra material to a normal potting mix to improve the drainage. 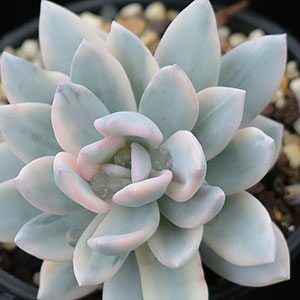 Pachyveria Powder Puff with its eggshell blue foliage with just a hint of pink on the tips is very popular. This variety is also known as x Pachyveria ‘Exotica’ ‘Shimono-Ashita’, and x Pachyveria ‘Kobayashi’. These multiple names or synonyms are common and the buyer needs to be aware. Pachyveria Myrtilla has pink to red flatter spoon shaped foliage.